With summer being a slow when it comes to television, I usually try to catch up on some shows that I didn't watch the first time around. 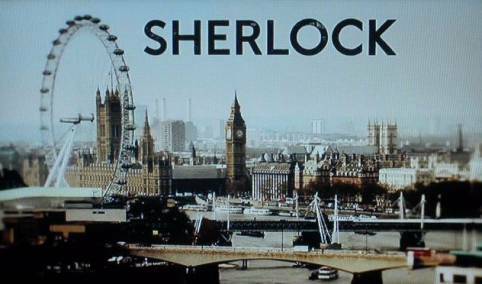 One show that garnered plenty of buzz earlier this year was BBC's Sherlock. Now, I'll come clean and admit that I'm a sucker for modern re-tellings of classic stories, so Sherlock was right up my alley, but for some reason I never took the time to seek it out on PBS. Thanks to Netflix Instant, I was able to watch the first series over the weekend, and I was immediately hooked. Right off the bat, Sherlock reminded me of USA's Psych only good. The funny thing is, I had the same reaction while watching Robert Downey Jr.'s Sherlock Holmes, which makes sense since Psych is nothing more than a cheap knock-off, but I'm not hear to bad mouth that show. From a narrative stand point, Sherlock wasn't all that different than all of the other crime procedural shows that rely on an outside expert (think Bones, Castle, Psych, The Mentalist, etc. ), but the cases in the first three episodes all felt fresh and new. I blame all of the British accents. The modern setting was also a welcomed change that could've been easily mishandled, but it just worked from the get go. While the murder/cases didn't stray too far from the traditional cop show formula, what made Sherlock special was the two leads, Benedict Cumberbatch and Martin Freeman, who are able to breath new life into the legendary Holmes and Dr. Watson. Of the two, Cumberbatch was something special as he was able to create a character that was brilliant, charming, but also manipulative and sometimes unseemly. Freeman also does a great job at being the classic straight man to Cumberbatch's eccentric, but it's hard to focus on anyone but Holmes whenever he's on screen. Luckily, the two work so well together that it would also be hard to imagine one without the other. Like all TV shows, Sherlock also had its share of misfires. Initially, I was not too thrilled with the depiction of Moriarty because it was too over the top and could be overkill when combined with Sherlock's equally larger than life presence. I did respect and enjoy how the writers slowly introduced Moriarty, but the reveal was a letdown. I'm willing to withhold judgment until the character gets additional treatment, but it's going to take a lot to make him a credible villain in my opinion. Underwhelming archenemy aside, Sherlock was a well-crafted, entertaining, and successful update of Sir Arthur Conan Doyle's iconic detective. It still has some work to do in order to be the best show of its kind, but give me Sherlock Holmes over Shawn Spencer any day.